It is located at West Godavari district. Its area is 673 sq km. It is a wetland, marsh habitat supporting a large variety of water birds. Garganys, Teals, Pocahrds, Spot bills Brahminy ducks, Open bill storks, Herons, occasionally Flamingos and Grey Pelicans. Accommodation is available at the Forest rest houses at Vijayawada and Eluru. Best season to visit October to May. Rail: 60 km from Vijayawada railway station. 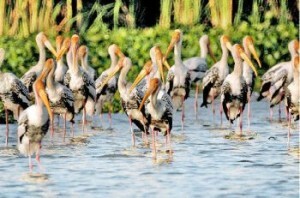 This entry was posted in Andhra Pradesh, Kolleru Bird Sanctuary. Bookmark the permalink.